A town north-west of Georgia's capital Tbilisi, and famous as the birthplace of Josef Stalin. A dedicated museum celebrates the city's (in)famous son with panache. The place also hit western headlines in the summer of 2008 during the short but violent war with Russia over South Ossetia, when Gori was briefly occupied by Russian forces. 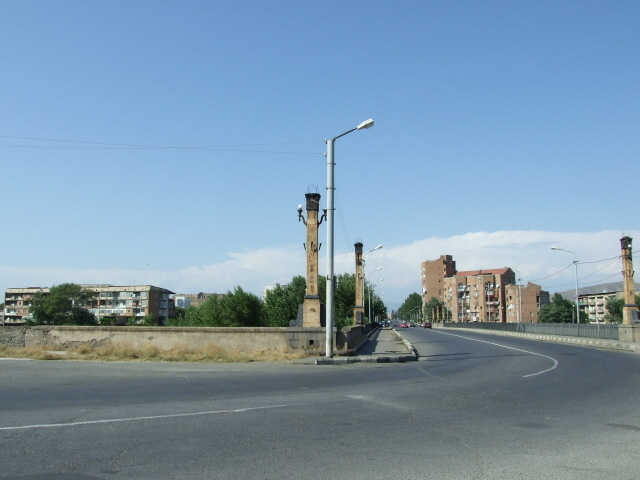 The scars of the bombings during this war can no longer be seen in Gori (everything was repaired quickly). But the local war museum has a small section about this war. What there is to see: Gori would quite probably not be on any tourists' map if it wasn't for the town's (in)famous Stalin Museum. The smaller local war museum is also worth a look. Other than that there's really not much to see in this rather drab provincial town. 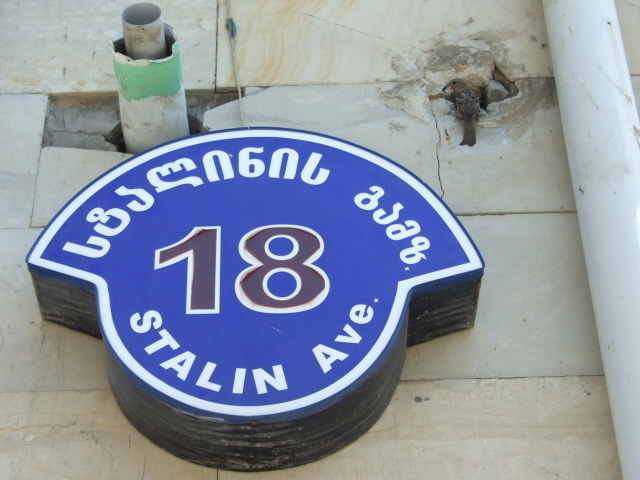 It is however remarkable that even the main boulevard in the centre which is named after Stalin is also labelled thus in English, not just Georgian ... and: no Russian! How much politics there can be in a simple street sign … (cf. under Georgia in general). You may have heard about the famous tall bronze statue of Stalin in Gori's main square (Stalin Square) in front of the town hall, which was one of the last few ones that was left standing after de-Stalinization in the USSR following the man's death in 1953, and also after Georgia gained independence, when it was even defended by the people of Gori. But unfortunately (?) it is no longer there today. It was torn down one day in June 2010 in the middle of the night. It was reported that a new monument related to the 2008 war should take its place (www.bbc.co.uk/news/10412097). At the time of my visit in August 2010, however, the spot where the statue once stood was still empty. The old Stalin statue, on the other hand, will be re-erected outside the Stalin Museum. When I was there, the foundations for the plinth were already being laid and a large photomontage-ed poster showed an artist's impression of what the place will look like once the work is finished – which may well be the case by the time you read this. 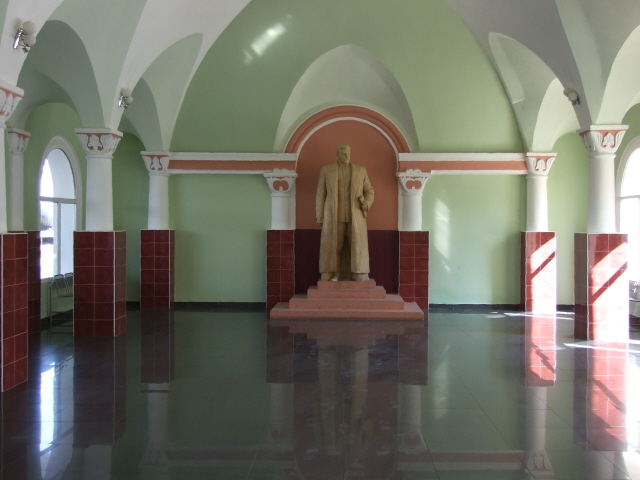 If you go to the train station across the river to the south of Gori, you can find yet another splendid marble Stalin statue standing in grand solitude in a polished empty hall adjacent to the main station hall. 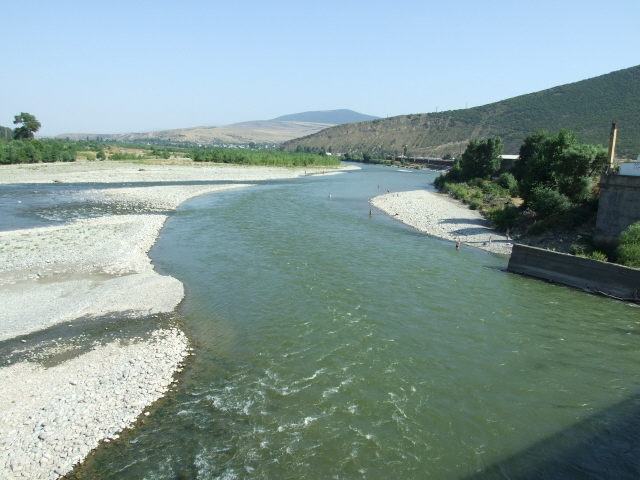 Location: some 50 miles (80 km) north-west of Tbilisi. Access and costs: not too tricky to get to, and quite cheap. 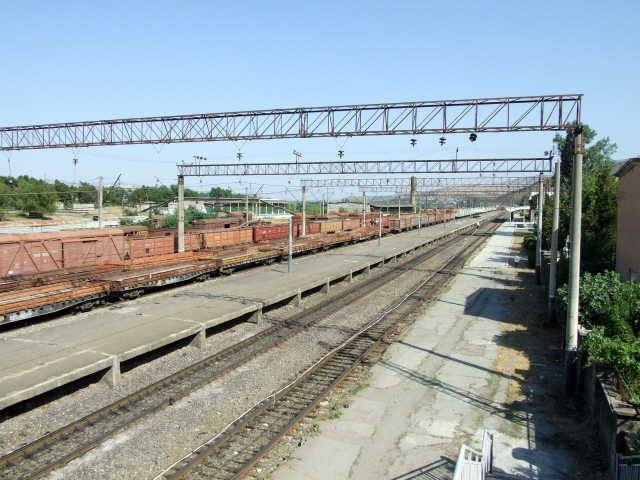 Details: From Tbilisi you can either take a train from the main station (ca. 2 hours); all westbound trains from Tbilisi going to Kutaisi and/or onwards to Batumi stop at Gori – but departure times are not necessarily convenient. Alternatively you can take a bus or marshrutka (minibus) from Tbilisi's chaotic Didube bus station. To get to the bus station you can take the metro – that's the easy bit. From the exit tunnel of the Didube metro station you enter the sprawling expanse of what at first looks more like an open-air bazaar, but indeed doubles up as the bus/marshrutka station. The buses going to Gori depart from the third yard, to the right of the market area around the second. You may need to ask for directions. You'd be lucky to find anyone speaking English, but the place name is at least easy to pronounce. If you know enough Russian you won't have many problems anyway. However, since all destinations signs on buses/marshrutkas are in Georgian only, it will also help if you learn the short four letters for "G o r i" in Georgian. Its pretty curvy script is not actually as complicated to learn as it at looks at first. Marshrutka fares you normally pay on board, for buses you need to buy a ticket from a window outside the station's large waiting/market hall. The fares are very cheap (I think I paid something like 3-4 GEL for a single ticket). The buses tend to be very old Soviet models that spew out black plumes of smoke whenever they have to go slightly uphill (which happens a lot in Georgia) and are very slow – but it's an experience! The journey takes about one and a half to two hours. For the return journey back to Tbilisi I was lucky enough to catch a delayed express train from Batumi … which was full of beach holiday families going home. It made the journey to Tbilisi in just under an hour – and the train conductor looking after the regular 3rd class carriage that I was in charged a pittance (2.50 GEL if I remember correctly). But you may be at the personal mercy of the conductor you get … this one was a flamboyant character who took some pride in having foreigners in his care. On learning that I was from Germany he managed to convey to me that he used to be stationed in Magdeburg, in the old GDR, as a young army conscript in Soviet times. Time required: The best part of a day if done as a day return trip from Tbilisi. 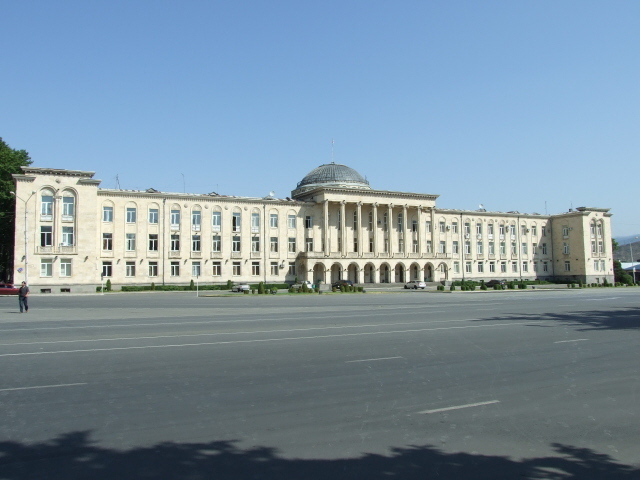 If you also want to see the town's and its surrounding's non-dark sights, then you may want to consider staying overnight in Gori and splitting the sightseeing over two days. Combinations with other dark destinations: The capital city Tbilisi is the perfect base for a day trip to Gori and offers a few minor sites of interest to the dark tourist itself as well. Combinations with non-dark destinations: Gori's only other tourist attraction of note is its mediaeval fortress which towers over the town west of the centre. The views are said to be good from the top, especially in the evenings towards sunset. A bit out of town, some 6 miles (10 km) to the east of Gori, the Uplistsikhe cave city is a premier ancient site going back to ca. 1000 BC (open 9 a.m. to 6 p.m., admission 10 GEL, plus taxi fare from Gori ca. 30-40 GEL). Closer to Tbilisi, the ancient capital of Mtskheta is oozing history and is a place of utmost importance to Georgians, also for its ancient churches. 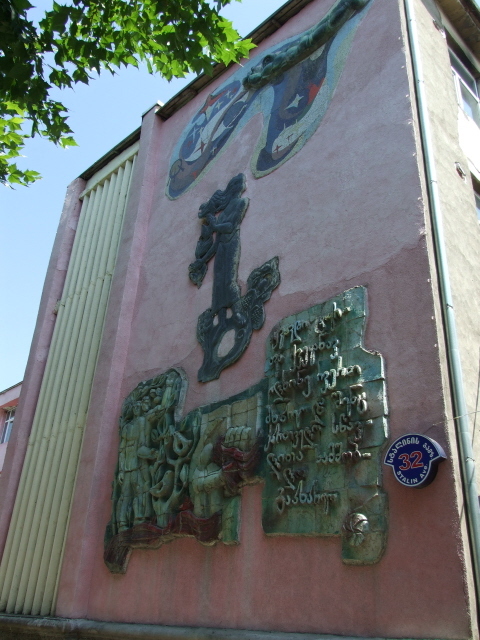 The place is better visited as a day excursion from Tbilisi rather than Gori, though.